Norwegian Morning Wood: But Why is the Cat Named Keanu? But Why is the Cat Named Keanu? Today we see the first major comedy event of 2016 (besides Deadpool. And Zoolander 2. Okay, so this is the first explicit comedy film that people are actually anticipating). Here we have Keanu (2016), which comes from the brilliant minds of Jordan Peele and Keegan-Michael Key. I will admit, though, that this is the cutest thing ever. Now, the only part of the last sentence that I really agree with is that Keanu is coming out today. I do not understand the appeal of Key & Peele at all. If we're going back to Zoolander (2001), I feel like I'm taking crazy pills. I'm living in a universe full of insane pod people where my opinion doesn't match up with critical or popular consensus at all. So, let's talk about that. Key & Peele met on MADtv, which ought to explain enough why this kind of humour doesn't really click. MADtv tended to be a more desperate version of SNL, although it didn't convert that underdog mantra into infectious energy like In Living Color or witty surrealism like The Kids in the Hall. It was always a show that never seemed to have anything interesting to say. This has of course plagued SNL at various times in its production, notably recently, but that show tends to be backed by a pedigree that glosses over its inconsistencies. MADtv was stupid without the self-awareness of being stupid vital to create that fulfilling gap which causes a deep enjoyment of a show in addition to spontaneous laughter. Key & Peele suffered from a different ailment, namely the inability for the principal architects to create a sketch where something happens. I really gave the show a chance, too. I desperately tried to like this show. There's no reason why I should hate it as much as I do. The sketches are just intolerable. They tend to start with a good joke or premise and then pound it into the ground far past its expiration point. Basic writing dictates that a scene needs to have a starting point, a turn, then an ending that demonstrates some kind of change from the beginning. Obviously, this is weirder when applied to sketches. But if you look at some of the more famous sketches out there - "Cowbell" "Dead Parrot" "Rick James" all have some kind of joke build-up, acceleration of tension, and unexpected wit and subtlety even when the parrot joke should no longer be funny. Key & Peele lacked all that. Half the show seemed to be them recounting other shows without any real critical insight. Now, that sounds pretty damned boring, but pop culture in itself isn't a joke. Jokes need to come from having some kind of spin or commentary, whether explicit or not. There are some sketches that work pretty well. "Family Matters." "A-a-ron." More often than not, though, I can't find any humour in their humour. Instead of penetrating and giving their work some excitement, they seem to find more comfort circling around the same topic until moving on. 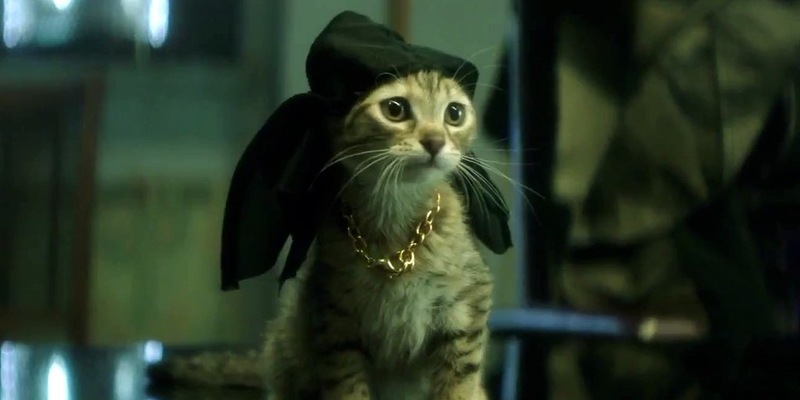 Keanu promises to be an awfully weird movie. It's a telling extension of their brand that they'd center around the retrieval of a stolen gangster kitty, but given their common evisceration of black masculinity, it's fair game. It's also a movie that white people should be very comfortable with, which also seems to be a staple of their work. Everything points to this being a single joke stretched over the course of an entire feature film, and I'm not sure that it'll hold up based on their track record. There's the possibility that the longform version of their humour will succeed, and both have proven themselves to be capable actors in other projects, ranging from Parks and Reaction, Childrens Hospital, to Fargo. I also don't really understand why the cat is named "Keanu." Is it a John Wick (2014) thing, like it was supposedly-but-not-really spoofing? Jordan Peele has claimed that there wasn't much to it besides a delight in using names that only have one connotation. That whole thing is weird. Pretty goofy and cute, but kind of a weird love letter that's not a love letter to Keanu Reeves. What do you think about Keanu? Are you on the Key & Peele bandwagon? Can you read more into their writing than I can? Leave it below.